Create business applications for mobile computing with Mobile Data Studio. Mobile Data Studio is used in over 50 countries. Deploy projects to Android and Apple iOS Smartphones and Tablets and Windows Mobile devices, and to Windows 10 Tablets. Mobile device side deployments are referred to as 'Mobile Data for Android', 'Mobile Data for Apple iOS', 'Mobile Data Client for Windows 10' and 'Mobile Data for Windows Mobile'. Mobile Data for Apple iOS is in the Apple 'App Store' as a free client side software for the iPhone, iPad and iPod Touch. 'Mobile Data for Android' and 'Mobile Data Client for Windows 10' are available for download below. You don't need to be a programmer to create powerful applications to improve business productivity and eliminate paperwork. It's a unique, simple, and low cost solution! A simple drag and drop of points process to design powerful projects for mobile data capture. Mobile Data Studio version 9.0 is current version. 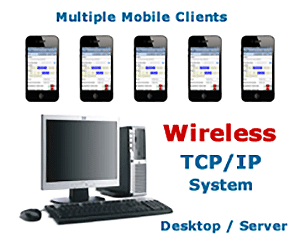 A fully integrated mobile project design studio, powerful and secure wireless client and server, and data management system. Turns Smartphones and Tablets into powerful data management computers. 'Mobile Data Studio' supports Android, Apple, Windows 10 and Windows Mobile devices for productivity. Normally it would take programmers days to write applications in code that now you can set up in a few minutes in Mobile Data Studio. 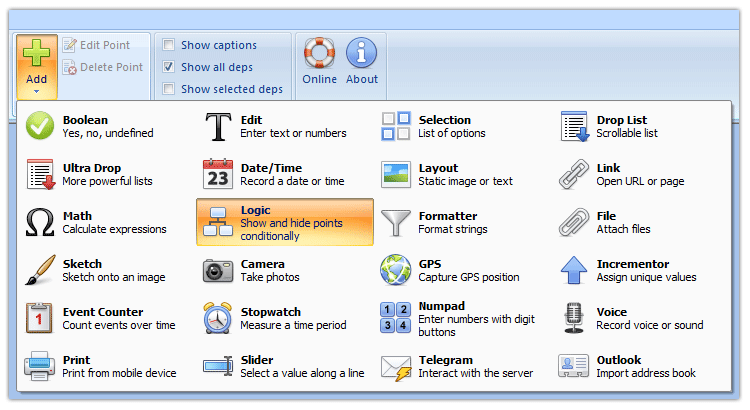 Simply 'drag and drop' from an array of powerful data capture and management functions. Mobile Data Studio is great value for money. Develop multiple projects to improve productivity. This will be the smartest app on your Smartphone, improving the competiveness of your business. Deploy Mobile Data for Android, Apple iOS and Windows 10 to Tablets with seven and ten inch screens for data entry in large survey and audit type projects. Mobile Data Studio enables data to be securely transfered wirelessly via any transmission medium that supports the common TCP/IP standard, including using Smartphones and Tablets via 4G, 3G, 4G LTE and 2G mobile networks and WiFi wireless LANs and WANs. TCP/IP connections can also be made via device 'WiFi Hotspot' and 'USB Tethering'. Elsewhere this would cost a lot! Mobile Data Studio manages multiple data streams concurrently from multiple Apple, Android, Windows 10 and Windows Mobile devices. One, three, thirty or three hundred mobile devices can be managed by the Mobile Data Studio server. Easy to set up; enjoy mobilising your business with software that is used 'day in day out' by business in over 50 countries in many industry sectors. Please enjoy a free 30-day trial of Mobile Data Studio, with all features included. Mobile Data Studio mobile clients run in Android, Apple iOS, Windows 10 and Windows Mobile, operating systems on Smartphone, Tablet and Pocket PC (Windows Mobile) devices. Projects/applications developed with trial Mobile Data Studio will run in the licensed software when purchased. Not all functions supported in Mobile Data Client for Windows 10 are supported in Android and Apple iOS, the exceptions are indentified in the Skills tutorial. Trial Mobile Data Studio installs to Windows desktop or laptop PC, or a Windows server, as for other downloads to Windows. Mobile Data for Android should either be downloaded direct to an Android mobile device from this web page and installed, or saved to desktop PC for install if Android device has an installer associated with sync software. The MobileData.apk file should be installed to the main storage on Android device. Mobile Data for Apple iOS is available as a free download at the Apple 'App Store' either via direct download or iTunes, search for 'Mobile Data Studio'. Mobile Data Client for Windows 10 can be downloaded direct from this web page to a Windows 10 tablet and the MobileDataClientSetup.exe file be run to install. NOTE: The links above are to the Apple App Store in Australia per URL address https://itunes.apple.com/au/app/mobile-data/id432455954?mt=8 . For your country App Store replace the 'au' with country domain; for example 'fr' for France, 'gb' for the United Kingdom, 'es' for Spain, 'cn' for China, 'us' for USA, 'de' for Germany. Please email support@creativitycorp.com with any download or install problems, copying any error messages to us, and we will respond promptly. The MobileDataStudioSetup.exe file will be located in the 'Downloads' folder on your computer if you chose the save location suggested before download. Close other programs which may be open before installing. Double click the file and it will 'unpack' to install on your desktop or laptop computer. (Note: (1) Installation to Windows 10, 8, and 7 on a network may require administrative privileges, software may not be installed from a 'User' account. Log on as an 'Administrator' before installing Mobile Data Studio. (2) If the installation stalls, please download and install Microsoft C++ Redistributable Package for applications developed in Visual Studio 2013. 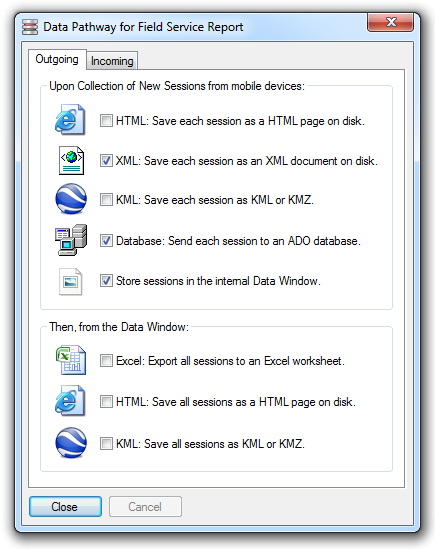 Mobile Data Studio Server on desktop PC: Go to Start and 'Programs' on your desktop or laptop PC and find the 'Mobile Data Studio' program in your PC's Programs listings. The Mobile Data Studio link will take you to the desktop version of the trial, from there open and design projects to install on a mobile device. 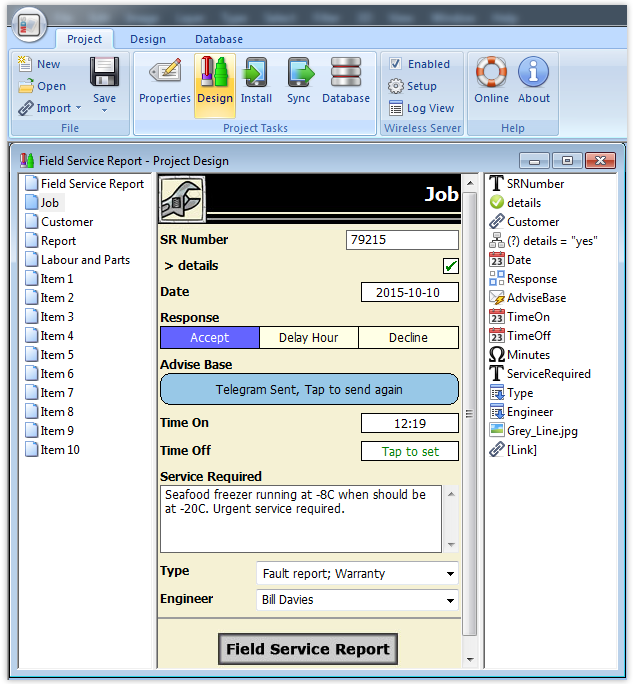 Open the Field Service Report project and other Example projects to explore designs and functions, in C:\Program Files (x86)\Mobile Data Studio\Examples. Open Log View in the control panel for the Wireless Server to show the Wireless Activity window and 'Listening on IP Address:' to determine the IP Address to be matched up in Settings in Mobile Data Studio on mobile client device. There may be two IP Addresses shown, for WiFi local area network and for connectivity with mobile phone network via the Internet. Android mobile client: The Mobile Data for Android software (MobileData.apk file) must be installed to Android mobile device and the device be connected to the Mobile Data Studio server before projects can be installed via click on the Project 'Install' icon per above. Connected Android, Apple iOS and Windows Mobile devices will appear as shown below. 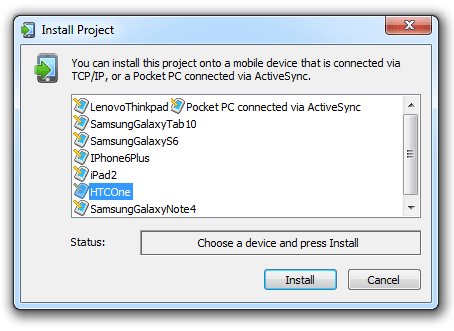 Select device and click to install project to Android device. See full instructions for installation and use on Android devices. Apple mobile client: Mobile Data for iOS is available as a free download at the Apple App Store direct or via iTunes, search for 'Mobile Data Studio'. The Mobile Data for iOS is 'full' software that will interface both with Trial Mobile Data Studio and serve as client device software on purchase of Mobile Data Studio (amongst the number of client devices licensed with Mobile Data Studio). See full instructions for installation and use on Apple iOS devices. Mobile Data Client for Windows 10: After installation of the Mobile Data Client by running the MobileDataClientSetup.exe file a folder showing 'Mobile Data Client' is shown in Start containing the 'MDS' icon which can be pinned to Start and Taskbar. See full instructions for installation and use on Windows 10 tablets and other devices. Windows Mobile client: Click the Project 'Install' icon to install Mobile Data for Windows software and project to Windows Mobile device; install to Default location main RAM (recommended), or SD card if other than default is selected. See full instructions for installation and use on Windows Mobile devices. The 'Start' or 'Programs' or 'All Apps' menu on the mobile device will provide a link to Mobile Data ('MDS' icon). Install other example projects to test them, they can be deleted later when you have designed your own projects. 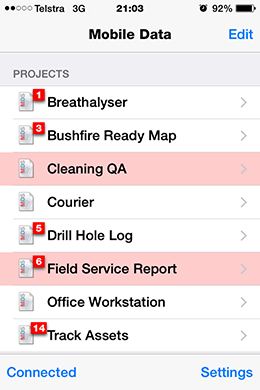 Mobile Data Studio can run multiple projects on a Smartphone, Tablet or Pocket PC. Before developing and running Mobile Data Studio projects we recommend reading the online Skills tutorial. MDS Server Operating Systems: To run Mobile Data Studio 9 server, recommended operating systems are Windows 7, 8, 10 and Windows Server 2008, 2012 and 2016. Windows XP is no longer supported; Windows XP users should continue with MDS version 7.3.2.1. 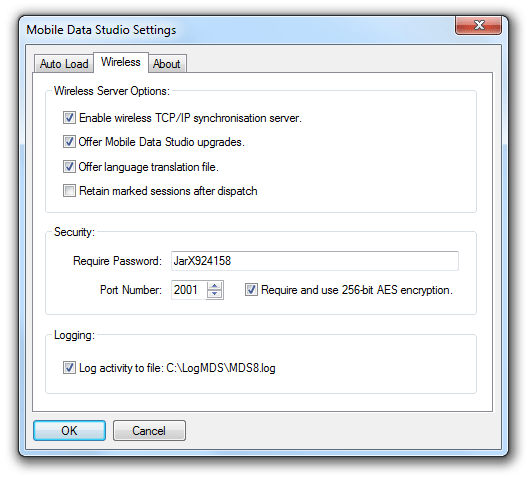 MDS Client: Mobile Data Studio client runs in Android 2 plus, 3 plus, 4 plus, 5 plus, 6 plus, 7 plus; 8 plus, 9 plus. Apple iOS 5, 6, 7, 8, 9, 10, 11 and 12 operating systems, Windows 10 and Windows Mobile 6.1 and 6.5. 'Mobile Data Studio' is a Business Name registered in Australia by CreativityCorp Pty Ltd.